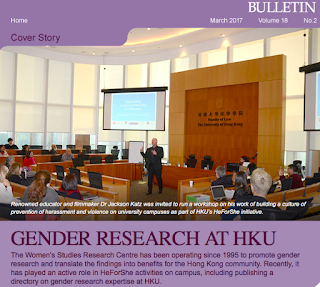 The Women’s Studies Research Centre (WSRC) and its scholar-members have deep ties to gender issues in Hong Kong. In the 1990s, they provided advice and input on the drafting of anti-discrimination legislation and the setting up of Hong Kong’s Equal Opportunities Commission. “We really do see the birth of Hong Kong awareness of equal opportunities as coinciding with our own development,” Convenor Ms Puja Kapai said. That development has gone through ups and downs. Until recently, the WSRC was fairly low-profile, despite organising academic events every year for International Women’s Day, a spring workshop to bring together academics and NGOs, and other events peppered throughout the year. Its fortunes started to change when HKU’s President, Professor Peter Mathieson, committed the University to the UN Women’s HeForShe initiative in 2015. The WSRC had the interest and expertise and so it was asked to provide support and expertise on gender issues. It was also invited to join a team producing a short online course on sexual harassment for new students. Moreover, it received funding from the University in December, 2016 to support its work as a platform for gender issues. Previously, it was entirely self-funded through a small private donation. Its activities in recent months have included co-organising talks on such topics as the gender gap in examination results and women in Hong Kong politics, and helping to organise and promote the HeForShe Reading Group and the ‘Gender Plus Series’ of interdisciplinary seminars. Under the latter, for example, the ‘Gender Plus Law’ subset hosted visits by two Canadian Supreme Court justices, including its first female Chief Justice, the Right Honourable Beverley McLachlin... Click here to read the full article.